DAVID FABER: Papa John’s announcing a $200 million strategic investment by Starboard Value, and the addition of three directors that they say will enhance growth and value creation at the embattled pizza franchise. 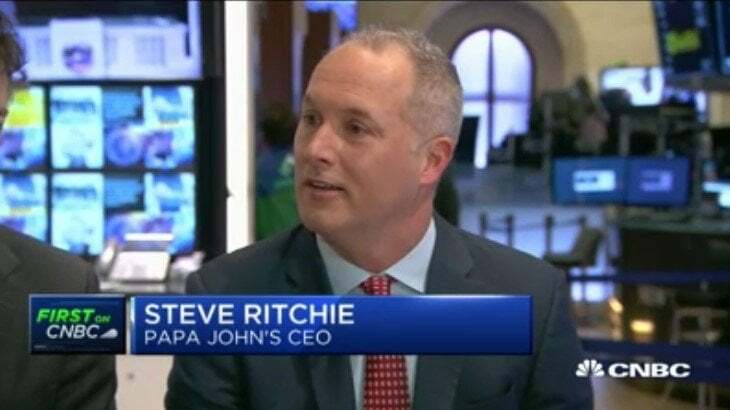 Here to discuss the future of Papa John’s, its CEO Steve Ritchie and Starboard Founder and CEO and now Chairman of Papa John’s, Jeff Smith. Guys, thanks for coming down and being with us. Steve, let me start with you. You know, you’re in a no-growth category. Some people say Papa John’s is behind on technology and your former CEO seems to have alienated a key constituency in your pizza-eating population. So, what are you going to do to change that? STEVE RITCHIE: Well, thank – first off David, thanks for having us here. It’s great to be here. So, exciting day for the brand yesterday. So, a $200 million investment, and a great new partner with Starboard Value and Jeff Smith as new Chairman of the Board. I have got to tell you, I have been at the brand for 22 years. I started as a delivery driver for 6 bucks an hour. So this investment and this opportunity really gives us an opportunity to focus on what’s most important. I started 22 years ago and I realized there was two key things that are most important and unique about the brand: one is our people and culture. So the opportunity to really focus in on transforming the culture of the brand. But what really struck me the most, my first day with the brand, is quality. We are the differentiated player in the category. And there’s something really different about what we do at Papa John’s that frankly I think there’s more to the story we need to tell to consumers. Many people don’t know that we have fresh, never-frozen original crust dough that’s six simple ingredients. Folks don’t know -- and that’s different from the other folks. Folks don’t realize that we use vine-ripened tomatoes that go from the vine to the can from the Central Valley in California. All of our tomatoes around the world are grown there. And other folks, we use packed -- not packed, but concentrated tomatoes. So this unique quality story is certainly one that we want to leverage. This new partnership with Jeff can really advance the company. DAVID FABER: Alright. I’m getting hungry, but none of that is going to translate necessarily into selling more pizza. What is your role here, Jeff? What are you going to do to help him execute on some of the goals he just laid out? DAVID FABER: Why? Why did you approach the company? What about it that you saw was an opportunity for Starboard? Potentially profit obviously. JEFF SMITH: You know, I’ll echo what Steve just said: I think it’s the best quality pizza in the category. So starting with the best product in the category is always a good thing. Now they’ve lost their way a little bit. Not just in terms of image but also in terms of messaging. We can come back in and we can get our customers back and we can get them to come back and appreciate the brand. Better ingredients, better pizza is a good thing. We did a lot of taste tests inside of Starboard. The diligence was fun. I really enjoy the pizza and really believe it’s the best. So that’s where you want to go. We’ve got go back to talking about how much fun pizza is and how great the product is. DAVID FABER: I can order a pizza on Domino’s app very easily. Track the whole thing. Many say you guys are behind in technology. Are you going to change that? STEVE RITCHIE: So we were the pioneer. We were the first to launch national online ordering back in 2001. We’re still very proud of all of our technology systems today. We’re going to continue to focus and invest in the customer experience. We also the first to launch a national loyalty program in the category. And we just refreshed. Launched a new loyalty program which we believe is now best-in-class where consumers have the flexibility to buy whatever product they want at Papa John’s. DAVID FABER: So you don’t feel like you’re behind at all? Those who say: well, you have got to spend more money. STEVE RITCHIE: There’s no doubt, David, that we’ve got to get better. And we’re going to continue to invest in the areas of product and technology and people. We know that we need to improve the inner-economics for our franchisees. But at the end of the day, we are a company that is differentiated by our products. So I’m really pleased to say we’re getting ready to launch a line of six new specialty pizzas coming up next month. We’re getting ready to expand and think about menu variety. We’re going to focus in on premium ingredients. So a lot of those investments are going to be into that area. We’re really excited about that. DAVID FABER: Many of us who know you well look back at Darden, of course the success you had there as an investment – with an investment and, obviously, with all the board members you put on there. Is there a similarity here, Jeff, in terms of the approach you’re taking with Papa John’s as you did with Darden? JEFF SMITH: It’s actually really similar. So let’s not focus on all of Darden, but really on Olive Garden. Because Olive garden was the struggling brand inside of Darden. And at the time -- people don’t remember now because Olive Garden is doing so well. Gene Lee is the CEO, he has done a terrific job. Olive Garden is doing well. But at the time we made the investment, Olive Garden was struggling. Olive Garden was a chain that people were talking about where the -- it was a dying brand. Their customers were getting older, and what could be done to reinvigorate? I remember talking at the time we made the investment and people were saying thing like that. We got involved and really focused on the positives, focused on the competitive advantages and really built up the quality and, most importantly, the customer experience. The guest experience. We’re going to do the same thing here. You know, in partnership with the company, in partnership with Steve, we believe the same opportunity exists. The quality is terrific. We have to focus on the competitive advantages and the customer experience. And the customer experience in pizza isn’t just about the quality of the pizza, which you were talking about before, David. It’s also about the whole experience. How do you order? How do you get it delivered? How do you have the whole experience and make it better? We’re really excited about it. Actually, I mean, I think you guys and Jim were talking about the technology at Domino’s. You know, their promotion right now is terrific. It’s a terrific opportunity. It’s a terrific opportunity as a de facto co-promotion for us. They’re out there for the next six weeks saying go buy a different pizza and they’ll give you rewards. So that’s wonderful. We’re loving that and invite the customers back to Papa John’s. If you buy Domino’s pizza, you just get Domino’s rewards. Right now, if you come to Papa John’s and come back to our pizza, you get our pizza, our rewards and their rewards, and they just get the picture, which is wonderful. DAVID FABER: Steve, did you guys try and sell the company and fail to do so? STEVE RITCHIE: No. You know, we had a -- it was a bit of a robust process. So we had a very comprehensive strategic review process, started September of last year. The independent members of the board, I, the special committee, you know, we looked at all options. It was a wide range of options. And you know, back to what we were just talking about – what Jeff was just talking about, the Olive Garden deal there. But there’s a number of other consumer-facing brands that Starboard was involved in. So we found the right financial resources to give us flexibility. But, frankly, even more importantly was those intangible values of leadership that has got experience in turn around brands. Obviously, we’re in a moment of distress here. Look, it’s been a difficult year for the brand but we know we have the plan to do the right things to move forward. And we brought on new leadership and an additional director also with Anthony, that’s got 30 years of experience with consumer brands. DAVID FABER: Mr. Snyder is still 26% holder roughly, I think, with the delusion from this convertible deal. And he likes to talk and he doesn’t want to be ignored. Is he going to be a continued problem for the brand? STEVE RITCHIE: You know, I think what we want to focus on is obviously what’s doing the best interest of the stakeholders I talked about. Our team members, franchisees, our customers. DAVID FABER: Have you talked to him? Has he agreed in is he happy or is he going to sort of start yelling and screaming about things to alienate customers? DAVID FABER: Does he believe it? Does he believe it? STEVE RITCHIE: John believes in the core values of the brand that I’ve talked about on quality and people. So, I certainly would not question that and, obviously, we’re hopeful we can bring John along. It’s a journey. DAVID FABER: All right. Now it’s time to talk Bristol-Myers. You’re here. Do you own the stock? JEFF SMITH: Talking about pizza, right? DAVID FABER: No, we’re talking about -- I’ve given you plenty of time to discuss it. Happy that we have. Do you own Bristol-Myers? JEFF SMITH: I am not going to discuss Bristol-Myers today. DAVID FABER: You can’t not discuss Bristol-Myers with me here, Jeff, for this moment. DAVID FABER: I’ve just given you ten minutes to talk pizza. JEFF SMITH: We love talking pizza. It’s fun. DAVID FABER: We’ve got -- Do you own Bristol-Myers? And if so, why? JEFF SMITH: We are certainly interested in the story at Bristol-Myers. DAVID FABER: Did you nominate any directors for the board? JEFF SMITH: I’m not going to discuss that right now. DAVID FABER: Why would you own Bristol-Myers? Do you not like the Celgene deal? JEFF SMITH: Well, let me go back and talk more broadly. JEFF SMITH: So our job, we believe our job is to represent the best interest of shareholders. So we look at lots of situations and we get lots of calls from shareholders who may be upset with things that are going on at different companies. We evaluate those situations to try and determine whether we can have a positive impact in representing the best interest of those shareholders. Bristol-Myers might fit that profile. DAVID FABER: But it might not. JEFF SMITH: It might not fit that profile. We haven’t made that decision. If we make that decision, I’ll tell you what, I will come on and talk to you about it. DAVID FABER: You’ll want to come on and talk about it because it would be an uphill climb it would seem conceivably to defeat a deal, the vote on which is coming up very soon. Which is why many people wonder why you would own it, if you really were trying to beat down the Celgene deal, unless you just like Bristol-Myers. JEFF SMITH: I think we’ll have to talk about it at a later date. DAVID FABER: And you did or did not nominate for the board? JEFF SMITH: Can’t answer that question. DAVID FABER: Well, you can. JEFF SMITH: I’m choosing not to answer that question. JEFF SMITH: I think we’re here to talk about pizza, David. STEVE RITCHIE: What are you guys having for lunch today? DAVID FABER: Well, we finished talking about pizza. But I will end with that briefly, to kind of end on a – did you eat a lot of pizza? JEFF SMITH: I ate a lot of pizza. We ate pizza -- a lot of pizza yesterday, too, at the company. We had a great time with the employees yesterday. Great time speaking with all of them and testing and having fun. I’ll be back there on Thursday and Friday this week, testing more pizza and new concepts. This is fun. This is what I love to do. DAVID FABER: Alright, well we appreciate you guys stopping by. Thank you both for joining us. STEVE RITCHIE: Thanks for having us on. We appreciate it.